Ignite Visibility University, a top digital marketing podcast hosted by John Lincoln (content is taken directly from the popular Ignite Visibility YouTube Channel). John Lincoln is CEO of Ignite Visibility, one of the top digital marketing agencies in the nation and one of the fastest growing company in the USA in the 2017 and 2018 Inc. 5000. As a digital marketing expert and in-demand public speaker, Lincoln is consistently named one of the top influencers in the industry. In 2017, he was the recipient of the Search Engine Land "Search Marketer of the Year" award. (Podcast) Want to know what is really working in 2019 for marketing? 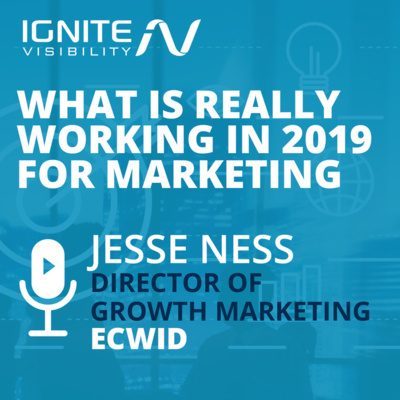 Jesse Ness, Director of Growth Marketing at Ecwid, walks us through some of the best practices that have allowed the Ecwid business to grow. Outside of this, Jesse also talks about Chatbots and why he is so excited about them right now. Jess is an industry veteran and this is one podcast you don't want to miss. This week: Pinterest is on the rise, Snapchat is on the decline, and the Yoast plugin has a great new feature. So you are ready for a new SEO strategy? Well, this is for you. This SEO strategy known as the keyword multiplier system was presented on at the Traffic and Conversion summit and has even been discussed by some heavy hitters in the industry. You want to have a successful event with raving fans? A great person to learn from is Mary Coppola, Vice President of Marketing & Communications for United Fresh Produce Association. In this podcast, John Lincoln interviews Mary about her career and what it takes to build a large event in a niche industry. John Lincoln solves the hardest problem in search engine optimization in 3 min and 15 seconds. This strategy works and will help you reach your SEO goals. This week: Google has a new toy, your pages blocked by robots.txt can still get indexed, and a new survey has lots of stats about online shoppers. Franchise marketing has really changed in the new digital world. There are new ways to attract franchisees and build them marketing programs. In this video, John Lincoln from Ignite Visibility covers the basics of marketing for franchises. This week: LinkedIn has a new targeting option, Google explains neural matching, and AMP for email has finally arrived. Here’s what happened this week in digital marketing. Don't miss the webinar! John Lincoln interviews Lori Taylor, Founder & CEO of The Produce Moms on the Ignite Visibility University Podcast. Learn how Lori has built a passion based business that helps people around the world through fresh produce. Big news in digital marketing this week. Facebook rolls out new ad metrics and Google is going to charge you more! Getting started with search engine optimization can be very confusing. In this video podcast, John Lincoln breaks down search engine optimization into simple steps. By the end of this video, you will have a good understanding of how search engine optimization works in 2019. Big news this week! Instagram has released local business pages and the social media ad networks make major updates! You need to learn this! Learn how to optimize for assistants and Google voice search. This week: consumers want authenticity in ads, marketers want authenticity in influencers, and Facebook has a new advertising option. A ton of stuff going on in digital market news. You have to watch this whole video because, towards the end, it gets pretty interesting! Get in on this fast! Live video coming to LinkedIn and more. Learn how to implement your first industry study to boost your business. This week: LinkedIn shares platform analytics, GMB gives you a new way to respond to reviews, and paid search continues to grow. Here’s what happened this week in digital marketing. The law cracks down on paid-for social media likes and followers, Snap hits a new milestone, and Quora continues to improve its ad platform. Here’s what happened this week in digital marketing. Learn exactly what Black Hat SEO is and why it can be detrimental to your brand. This week: AI is on the rise, marketers are increasing ad spend on LinkedIn, and wait until you hear about how many people use Instagram Stories every day. Competitors are bidding on your branded terms in AdWords taking up all your real estate, what can you do about it? This week: Google Chrome is making developers unhappy, LinkedIn has a new ad targeting feature, and plenty of people say Facebook doesn’t get their interests right. Here’s what happened this week in digital marketing. This week: Instagram influencer marketing is on the rise, DuckDuckGo continues to enhance its service, and wait until you hear about how much consumers spent during the holiday season last year. No matter what profession you're in, you have to stay mentally strong. Do you want to know the ONE process that will radically change your business and improve it over time? Are you ready to surpass your 2019 digital marketing goals and get results? Don't miss these tips! This week: DuckDuckGo hits a new milestone, there’s a new way to advertise on Quora, and businesses can now schedule videos directly to Instagram. Here’s what happened this week in digital marketing. Learn exactly what you need to know for search engine optimization in 2019. This week: Online sales soar, good news for Instagram advertisers, and there’s a new bidding platform for Amazon ads. Here’s what happened this week in digital marketing. This week: Bing shares top holiday search terms, Instagram sponconning is a thing, and wait until you hear about how many Amazon reviews for electronics are fake. Here’s what happened this week in digital marketing. Want to have the perfect social media marketing strategy for 2019? In this video, John Lincoln covers some of the most important factors for social media marketing. It is important to consider things like your community building strategy, your performance advertising strategy, your social media campaign strategy and more. When thinking about your social media marketing strategy, make sure you focus on these important points. Social media marketing is now really about creativity that cuts through the clutter and social media advertising. Google My Business is becoming more prominent in search results. Learn some of the new Google My Business features you should be taking advantage of for this year. This week: Bing beta-tests a new UX tool, consumers like recent reviews, and a few companies tell us about popular topics and trends. Here’s what happened this week in digital marketing. LinkedIn advertising is getting better than ever. In fact, 2019 could be the year where we see the best returns from the platform. When it comes to LinkedIn, there are many ways to target customers. First, you can do simple ads in the sidebar of the feed. Contact forms are incredibly important for lead generation - and if you don't do them right, you're setting yourself up for failure. In this video, I'll go over how to set up contact forms that are effective for both you and your sales team. This week: Facebook explains its search algorithm, WordPress rolls out a major update, and Amazon ad spend soared on Cyber Monday. Here’s what happened this week in digital marketing. This week: New insights on last year’s holiday ad spending, AMP Story Ads are out of beta, and it sure looks like the Google search algorithm has a bug. Here’s what happened this week in digital marketing. Online lead generation can be tough. But if you have the right pop up strategy in place, that can make it much easier. What people do not realize, is that online lead generation is about meeting the prospect at the right place and the right time. A simple pop up can help do this. This week: Google rolls out new ad position metrics, Oracle has a new tool for pre-bid ad filtering, and holiday sales are projected to hit a new record. Here’s what happened this week in digital marketing. This week: Consumers opt for brand familiarity over search rank, more marketers are shifting ad dollars to Amazon, and Quora has a new bidding strategy. Here’s what happened this week in digital marketing. This week: Facebook Attribution emerges from beta, backlink IP addresses don’t affect search rank, and Snapchat is still the most popular social platform among teens. Here’s what happened this week in digital marketing. This week: Facebook has a new tool for partners, Google shuts down the social media site you never used, and wait until you hear about how much marketers are spending on video ads. In this video, John Lincoln talks about how to use review sites and aggregators to support your digital marketing strategy. This innovative video gives out of the box strategist for you to try. This week: Reddit hits a milestone, Snap rolls out a new ad format for the holidays, and wait until you hear about how much Google paid Apple to remain the default search engine on Safari. Here’s what happened this week in digital marketing. In this video, John Lincoln addresses the question, "Is SEO Dead?" In his direct response, John Lincoln does his best to take a non-bias approach and give marketers a real answer. Learn how to get online reviews for your business and learn how to deal with bad online reviews. This week: Adobe buys Marketo, digital ad spend is more than half of all ad revenue, and Google updates its image search algorithm. Here’s what happened this week in digital marketing. Cross-channel marketing - How to combine your Google and Facebook audiences for more effective campaigns. This week: Facebook has some new goodies, Pinterest reaches a new milestone, and Google makes it easy for you to split-test AMP landing pages. Here’s what happened this week in digital marketing. Ignite Friday - Big Instagram And Facebook News! This week: LinkedIn rolls out a paid media worksheet, a recent survey shows Facebook engagement is dwindling, and Google has a new search engine. Here’s what happened this week in digital marketing. Thinking about digital media buying? In this video turned Podcast, John Lincoln discusses digital media buying, why it is the future and how online media buying agencies work. This week: LinkedIn introduces automated bidding, YouTube is making non-skippable ads available to all creators, and wait until you hear about how much video ad spend is expected increase over the next five years. Want to increase sales on your eCommerce website? In this video, John Lincoln from Ignite Visibility covers how to increase conversions once your visitors enter your eCommerce checkout process. This week: Google gains in smart speaker market share, Pinterest is attracting back-to-school shoppers, and wait until you hear about how many EU domain visitors granted GDPR consent. Here’s what happened this week in digital marketing. You want to grow your business online? This is the way to do it. In this video, John Lincoln covers important and modern strategies to scale what is working in digital marketing. Google releases the medic update, Facebook is rolling out new features for business pages, Snapchat takes another hit, and Pinterest has a new video ad format. This week: Google confirms yet another update, Facebook updates video ad metrics, and Square has a new toy. Here’s what happened this week in digital marketing. This week: Facebook shares tank, podcast revenues are soaring, and the mobile-first index still has a long way to go. Here’s what happened this week in digital marketing. When it comes to Instagram marketing, many people feel it is not the right fit for business to business type of companies. But the fact is, they are wrong. Instagram marketing can be very effective for B2B. This week: the top reasons people unfollow you on Twitter, Amazon hit the jackpot on Prime Day, and some eye-opening new stats about PPC. Here’s what happened this week in digital marketing. Ignite Friday - Facebook Rolls out AR Ads And More! This week: Facebook takes AR to the next level, Instagram expands ad offerings, and Google can help you track down thieves. Here’s what happened this week in digital marketing. Want to know if your website is fulfilling your target objectives? If so, then you should monitor Google Analytics goals. Proven B2B Pay Per Click Advertising Campaign Tips - Big Impact! Ignite Friday - Google Page Speed Update Is Coming And More! This week: Instagram hits another milestone, Google Home speaks Spanish, and wait until you hear how much click fraud is out there. Here’s what happened this week in digital marketing. How Google Advertising Really Works In 2018? John Lincoln discusses Google Advertising and key takeaways from the Google Digital Breakfast Event hosted by Google and Ignite Visibility on 2-27-18. Learn about the customer journey, new audiences, mobile and video creative. This week: Instagram reaches a new milestone, YouTube has some new testing toys, and the Supreme Court just dealt a blow to e-tailers. Here’s what happened this week in digital marketing. This week: Podcast revenues reach new heights, Instagram adds e-commerce support, and strategists love location targeting. Time for a website redesign? It very well maybe. The problem is, many brands have trouble telling when it’s time for a tweak and when it’s time for a total overhaul. This week: GMB is adding new post types, Instagram spills the beans on its feed algorithm, and e-commerce sales continue to rise. You want more featured snippets for your website? Well, here is how you get them. In this Podcast, we cover Google featured snippet data that will help you rank in this coveted area of Google. Every website wants to have a higher domain authority. If you have a higher domain authority, you can rank better for targeting terms. Learn more about Moz domain authority. This week: Pinterest is growing faster than many had expected, Google beats Facebook in mobile referral traffic, and Bing Ads now offers in-market audience targeting. Here’s what happened this week in digital marketing. GDPR (General Data Protection Regulation) is very important. In this podcast, we cover GDPR compliance requirements for businesses, with a specific focus on marketing. This week: Facebook launches an influencer marketplace platform, Twitter has a new ad network, and Google Trends gets an update. Here’s what happened this week in digital marketing. This week: Facebook introduces new reporting tools and a Stories ad format, Google shortens its search snippets, and Amazon tests the remarketing waters. Here’s what happened this week in digital marketing. Bounce rate is one of the most important indicators of website success. Learn what bounce rate is, what your bounce rate should be by industry and how to improve your bounce rate. Ignite Friday - Digital Marketing News This Week! This week: Instagram announces new features, Facebook pushes more Live video, and Google unveils responsive search ads, image guidelines, and more. Here’s what happened this week in digital marketing. A drip email marketing campaign can make a major impact on your business. In this Podcast, John Lincoln discusses how to use a drip email marketing campaign to improve your business. This week: you should change your Twitter password, Snap sales slump, and Google has a new ad type. Here’s what happened this week in digital marketing. Learn everything that happened at Facebook F8. In this update, John Lincoln provides the Facebook F8 News. There was so much that happened at Facebook F8. LinkedIn advertising is better than ever. Sure, it is still a little expensive and clunky, but more and more brands are flocking to it for good reason. Ignite Friday! Digital Marketing News This Week! This week: tech companies report great earnings despite some bad press, micro-influencers love Instagram, and Facebook is giving video creators more ways to put cash in the bank. Here’s what happened this week in digital marketing. This is a great SEO strategy. In this podcast, I’ll take you through a tried-and-true system grow SEO traffic and results. The old debate, Bing vs Google for SEO. In this podcast, John Lincoln covers Bing Search Engine History, what is the common between Bing and Google and what is different between Bing SEO and Google SEO. When it comes to conversion rate optimization, the most important thing is to understand the customer journey and better refine your website to adapt to that. In this podcast, John Lincoln from Ignite Visibility covers heat maps, content analytics, in-page analytics and pop ups. Watch now to get more conversions and improve your site. Did you lose your website traffic? Here is a video by John Lincoln from Ignite Visibility that will help you get it back. There is a lot that you need to check. You need to check your analytics, Google search console, your keyword rankings, MozCast, and more. Customer journey mapping has been done in so many different ways, people are confused on what it exactly is! In this podcast, John Lincoln from Ignite Visibility discusses customer journey mapping, how it works and how to set it up for your business. If you are not doing customer journey mapping, you should be. Learn about 404 errors! What is a 404 error? How to use 404 errors to your advantage? How to reduce 404 errors? Internal linking strategy for SEO can really help your rankings! In this podcast, we cover. What is an internal linking strategy for SEO? How to do an internal linking strategy for SEO? How to get internal linking SEO results? What is a robots.txt file? In this podcast, John Lincoln gives on overview of the robots.txt file for SEO. John Lincoln from Ignite Visibility covers remarketing, one of the best ways to run ads online. Remarketing cookies people who come to your site and allows you to message on them through networks around the internet. Learn how remarketing can help your business and why you should be doing remarketing. In this podcast, John Lincoln from Ignite Visibility covers how to get more traffic from old website content. This is a process that works very well to boost individual rankings, as well as overall website rankings. Watch the video now to learn how to get more traffic. In this Podcast, John Lincoln covers how to use email marketing to generate leads and become an influencer. Learn more about fetch as Googlebot now. In this Podcast, John Lincoln gives an overview of the fetch as Googlebot tool. In the modern landscape when considering how to create a digital marketing strategy, you need to think about all the touch points of the consumer. In this podcast, John Lincoln walks you through these touch points. In your digital marketing strategy, you might want to incorporate Facebook, LinkedIn, YouTube, AdWords, Yelp, it all depends on your business. When you look at Google analytics, you can get a pretty good idea of your customer journey. This podcast will teach you how to do keyword research. When doing Google SEO keyword research you generally want to start with a few core terms that are going to convert. After that, you want your Google SEO keyword research to become a bit more broad. This is going to allow you to expand your reach and get into new areas. When it comes to international SEO and local SEO, webmasters often want to use IP location detection and redirects. When it comes to email marketing automation, there is a lot to know. First, you need to determine your goal. Next, you need to map it out. Finally, you need to execute. Once it is running, you have to review and refine. There is a lot to know regarding creating website popups. You can serve website popups by landing page, by device, by location, by referral source and so much more. In this podcast, John Lincoln covers one SEO strategy that you must do. There are so many SEO strategies out there in the world. This is one great and can result in some quick wins. Amazon Seller Central vs Vendor Central! This podcast covers all the important points of Seller Central and Vendor Central! When it comes to brand searches and direct traffic, they can really help your business and your rankings in Google. Direct traffic is already seen as a ranking factor on some level and a strong brand also helps, but Google has not specifically said brand searches help. If you want to improve your click-through rates, this is the podcast for you. Google Search Console shows you your impressions and CTRs. You can determine what pages have a bad click-through rate and which pages have a good one! Then, you can improve the pages with a bad click-through rate. There is a lot to know about long-form content. In this podcast, John Lincoln covers long-form content and how it relates to SEO. John Lincoln from Ignite Visibility provides all the details you need to know to get your long-form content ranking. We are talking images, h1, h2, linking and so much more! Watch this video to learn how to be the best at long-form content. Have you done a social media audit lately? A social media audit can really put things into perspective. In this Podcast, we tell you how long SEO takes. John Lincoln, CEO of Ignite Visibility and the 2017 Search Engine Land Search Marketer of the Year answers the question, How Long Does SEO Take! The amount of time really matters on the website. How old is the site, does the website have a penalty, where is the website ranking, what are the competitors doing! There is much to think about, when considering how long does SEO take. Review schema can help you get review stars in Google and increase your CTR and general branding. Learn how this works. If you want to learn how to start a blog, this is the perfect podcast for you. John Lincoln, CEO of Ignite Visibility, gives details on how to start a blog that your industry will love. Want to learn how to start a website? In this Podcast, John Lincoln covers how to start a website from scratch. While the video doesn't cover everything, it does cover 10 important factors for starting a website and getting it going. You need a good domain name, you need to optimize the site, you need to set up your tracking, you want to launch social media profiles, you want to have ads going and more! Local lead generation services really take making sure you know the right keywords, you have the right strategy, you are specific and more. Local lead generation services Include Schema.org Making sure you have great copy Embedding a map And more Listen to this Podcast by John Lincoln to learn more about local lead generation companies and local lead generation services. Facebook CPM stands basically means how much you pay for 1,000 impressions on Facebook. If you pay less for your CPM, you can get a better return. But, you also want to pay for Facebook CPM in an audience that has the highest CTR and conversions. Facebook CPM is an important part of the advertising platform. Little tricks make a big difference. You need to have good images, great text, a call to action and amazing targeting. Learn more about Facebook CPM in this Podcast by John Lincoln from Ignite Visibility. In this video, John Lincoln from Ignite Visibility talks about how to build a chatbot for your website or build a chatbot for Facebook. Building a chatbot is not a simple task. You have to think about the main purpose of the chatbot, what do you want it to respond to, how should you channel the user into the next step, at what point do you hand them off to the right person, do you integrate an appointment setting feature. When it comes to chatbots, you can really mess up if you don't have the right sequence in place. What is a backlink? Well, it is a link from one website to another website. Backlinks come in all shapes and sizes. The best backlinks are editorial links from authoritative websites. If you want to check your backlinks, you want to look for these links (being the best) and really all the other links need to be evaluated. Google has made SEO and website builders have made SEO incredibly complex. Because of this, there is a massive field called technical SEO. Want better returns in your digital marketing? It is 100% possible, but you have to scale! If your budget stays the same, how can you grow? The Google Display Network is getting more advanced. But many of the strategies used are too basic, and result in companies wasting a lot of money. With these same video marketing strategies, we have been able to generate over 159,000 videos for key videos by distributing them through the web. Think of what that can do for your business! Want to know what a good click through rate is by industry, season and channel? How about the difference in click through rate for SEO, PPC, display, Facebook and more! In this video, we cover what is a good click through rate. AdWords Extensions can significantly impact your bottom-line when it comes to pay per click marketing. In this video, we cover all the different options and even show examples. Want to increase your page speed? Well, this video is for you. In this video, we go over the most important tips for increasing page speed on your website. Looking for eCommerce tips to increase your sales? These eCommerce tips can really help your conversion rate optimization. Ready for the rebranding strategy you need to have success?! In this video, we cover rebranding strategy and how to move to a new domain. SEO in 2018 is different than years past. That is why in this SEO guide we cover all the most important items now. Digital marketing tools can make a big impact. In this video, we discuss unique and trusted digital marketing tools pros don't always share.